The basic functional unit of kidney is the glomerulus. Any renal derangement at that level can lead to a multitude of diseases. The renal as well as glomerular disorders secondary to other causes such as hypertension, diabetes, other vasculites, drugs, malignancies, etc. have been adequately addressed. However, the primary glomerular disorders, due to an ambiguity regarding their genesis, have yet to be explored properly. Though these diseases are clubbed under the common head of "primary", they consist of various distinct subtypes with markedly different mechanisms of pathogenesis, course of the disease, response to treatment and prognoses. This clinical update explores the various types of pimary glomerular diseases with an aim to enhance the reader’s knowledge and aid in timely recognition and precise diagnosis of glomerular diseases to help chart the appropriate treatment of each individual condition. The first chapter elucidates the clinicopathological correlation of primary glomerular diseases to help differentiate them from each other and from other similar differential diagnoses without resorting to renal biopsy in all the cases. The second, third and fourth, chapters explore the various aspects of Proliferative Glomerulonephritis, Idiopathic Nephrotic Syndrome and Heredofamilial Glomerular Diseases. The last chapter summarizes the clinically relevant current perspectives regarding the pathogenesis and treatment modalities of all the primary glomerular diseases. This book will help the readers understand the intricacies of the aspects mentioned above and guide the practitioner to diagnose and manage Primary Glomerular Diseases with special reference to practical experience in India. 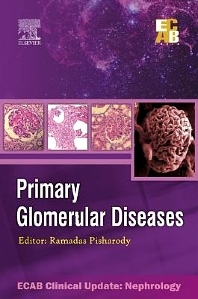 The authors have put together the most relevant facts about the disease for an easy comprehension and understanding of primary glomerular diseases by practitioners and students across the specialty.